2 Why Azure Cosmos DB? This blog post was co-authored by Nikisha Reyes-Grange, Senior Product Marketing Manager, Azure Marketing, and Balamurugan Balakreshnan, Cloud Solution Architect, CSU-Data and AI. Johnson Controls has been a pioneer in building management solutions and services since founder Warren Johnson invented the first electric room thermostat in 1885. Johnson Controls has introduced many innovations to the building industry over the years and are now tackling a problem that costs the building industry billions each year. Modern buildings include multiple systems that handle everything from building management to HVAC to security. These systems are managed by protocols, proprietary systems, and applications without a common data model, which prevents interoperability, limits scalability, and costs the industry an estimated $15 billion annually. 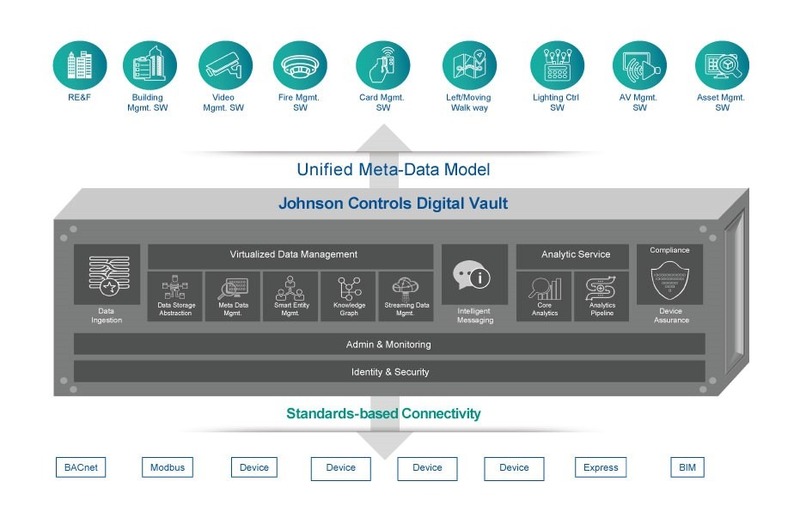 To help building operators gather and understand data about their buildings, operations, and occupants, Johnson Controls created Digital Vault to integrate internal and external data sources and present a harmonized view of energy usage, security breaches, fire alarm status, temperature controls, and other building management systems. 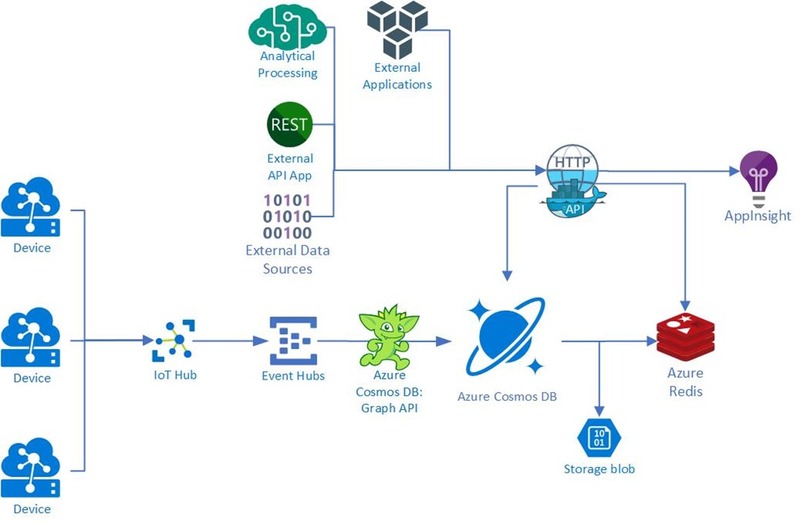 Digital Vault, powered by Azure Cosmos DB, simplifies object relationship management through a single Application Programming Interface (API) layer for IoT data and events while at rest and in motion. Another API layer leverages Azure Cosmos DB’s auto-indexing and multi-modal capabilities to accept data in forms ranging from key-value to graph. Digital Vault is then able to create a virtual version of a physical structure, like a floor or room, making it easy to conceptualize the relationships between building assets. Combining and processing data from Operational Technology (OT) and Information Technology (IT) of smart environments, Digital Vault creates a real-time knowledge graph that can answer questions about a building’s past and present conditions and make predictions about its future. OT data comes from devices and sensors in the building, and from HVAC, fire, lighting, security, IT, asset tracking, and more. The challenge in such an environment is the variety, volume, and velocity of data. As devices evolve over time, so do their schema and data models. With multiple generations of devices present in buildings, a data store must flexibly handle a variety of schemas. Sensors can save data at high rates, dramatically increasing the volume of saved data as the number of sensors increase. Velocity increases as data stores power real-time views, dashboards, and decisions, while also enabling historical data to be leveraged for advanced analytics and AI. By processing incoming OT data, Digital Vault can perform common data cleaning and analytic functions automatically. Building owners and application developers do not have to spend time building out a processing system for streaming data. The raw and processed data from devices is available in one spot, with common algorithms for filling missing values, cleaning and smoothing outliers, and many analytic and normalization functions already applied to the stream. In order to service thousands of buildings around the world generating billions of daily data samples, Johnson Controls knew they needed a platform-as-a-solution (PaaS) data store that could provide global service, manage huge volumes of data, scale as needed, reduce costs, and keep operational complexity low. They turned to Azure Cosmos DB to meet these needs while also easily managing data in a variety of models, auto-indexing data, and integrating with other Azure services. Digital Vault uses Azure IoT Hub to collect data streams from devices in buildings, Azure Event Hubs to manage the streams of data, and Spark in an HDInsight cluster to process the full stream and apply the analytical algorithms that embody Johnson Control’s 135 years of experience in building management. Azure Cosmos DB is at the heart of the processing system, feeding in additional data as needed and storing processed data, with its Graph API allowing developers to process graph data in any language with minimal integration time. For a building to be truly smart, it must have access to a significant amount of IT data – data that has traditionally been held in multiple silos, with no connection to OT data. To store and manage the IT portion of the knowledge graph, Johnson Controls again turned to Azure Cosmos DB. Just as with the OT data, there is a huge variety in schema and shape of IT data. Digital Vault ingests, stores, and incorporates IT data into a building’s knowledge graph using the Azure Cosmos DB Graph API. This makes it possible for Johnson Controls’ developers to use industry-standard APIs for processing graph data from any language. This graph understands the relationships between different types and sources of data and makes it possible to navigate among the many sensors, assets, people, and processes in the building. Digital Vault is, in turn, able to assess the current health and maintenance history of equipment and apply predictive models to anticipate future status and trends.